NEWS: Emirates is moving to a new type of inflight entertainment system, with Digital Widescreen ICE replacing the older tv&radio and the early ICE system. The new AVOD system is a vast improvement on the previous generation, being faster and offering better features, including many more films. Emirates have seatback TV screens in all classes - indeed, it claims it was the first airline to do so. There are however three different types of inflight entertainment, and this can seriously impact on your travelling pleasure. Check your aircraft carefully, although the situation is getting better, with three quarters of planes now having at least the early ICE system. 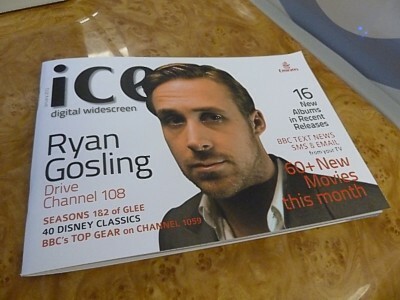 The three systems are ICE, ICE Digital Widescreen; and Emirates tv&radio. 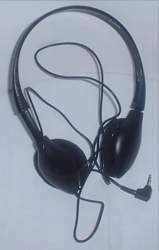 Headphones in economy are of the single overhead band type, with a single 3.5mm jack plug. This plug can cause problems, and on older planes tends to work loose. Audio is in Mono, and reproduction isn't that good. 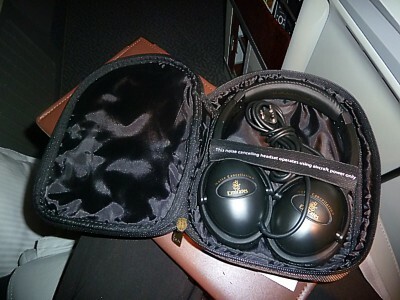 However headphones in Business and First Class are true noise reducing headphones, and are much better. 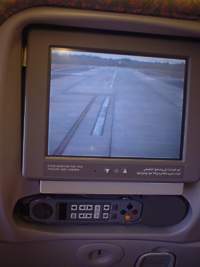 For all of Emirates' fleet, there is a camera in the nose of the plane, and another one looking downwards, so you can see the landings and takeoffs. There is also the usual channel with the latest version (including the 3D view of hills) of Boeing's scrolling world map. ICE stands for Information, Communication and Entertainment, and if you have a choice of planes, it is the in-flight entertainment system you want. It is a full AVOD (Audio Video on Demand) system, which means you can select what you want and when you want to play it. The four coloured buttons on the remote are play, stop, fast forward, and rewind. ICE is found on the Emirates Airbus A380-800, Airbus A340-500, Boeing 777-300ER/ULR and Boeing 777-200LR/ULR aircraft. Alas, most of the Boeing 777-300 aircraft still have not been retrofitted with this system. Emirates seatback TV screens are true touchscreens, and all the controls can be selected by touching the screen, as well as on the remote which is on the seatback infront of you in Economy, or in the armrest in Business (and Economy bulkheads). Screens are large, with economy getting a 10" seatback screen, and business having a 15" screen, although it is in the back of the seatpod infront of you, so it can seem a bit distant. ICE also contains a link to an in-flight email server which allows you to send or receive emails, although it does cost US$1 per message, which is a bit steep. There is laptop power - of a kind. It comes in the form of a USB port below most screens, which you can use to charge your device. 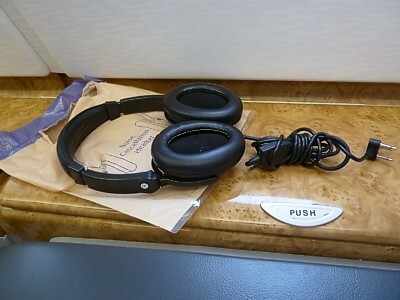 It is also a full USB port, into which you can plug cameras and iPods, and view films on the larger seatback screen. After all this technology - it can come as a dispointment to see the inflight offerings on Emirates. There are over 130 on-demand film titles, but many of these are bland holywood nonenty films, or what are called 'recurrents': popular films of a few years back. There are only about 3 or 4 current blockbusters loaded onto the system. 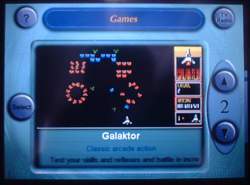 There are however vast numbers of television programmes, with complete series of many popular ones stored on the system, plus around 350 audio channels, and around 50 video-game titles, of which Galaktor is the most well known, and the most fun. Speed is very good. ICE Digital Widescreen is an updated version of ICE. The video selection has been doubled, and the screens show films in widescreen, which oddly reduced the screen size for some films, with black bands appearing to the left and right of TV shows that are nor recorded in widescreen. Emirates Digital Widescreen ICE is installed on most new A380s. On some older aircraft, and the Boeing 777-300s, you'll get the old inflight entertainment system. It is offered mainly on short haul routes, but sometimes you'll find it cropping up on routes such as London, with over a third of aircraft having it. There is nothing partiucularly wrong with it, however Emirates IFE: TV&radio is an old first generation non-AVOD system, with only 15 video and 26 audio channels, as well as 50 video games. Film selection is good, but not brilliant, with films shown from the European sequence, about 2 months behind US showings. There are 6 current run movies, 1 film from the 50s, a "World Cinema" film (from the country that isn't the UAE), an Arabic film, and 6 TV channels. The TV channels show a channel of Comedy (Friends and Frasier) Sport (latest football games) Arts (opera and singers) Quest (programmes that won't go elsewhere like Faking It) and Arabic (Domestic UAE programmes). 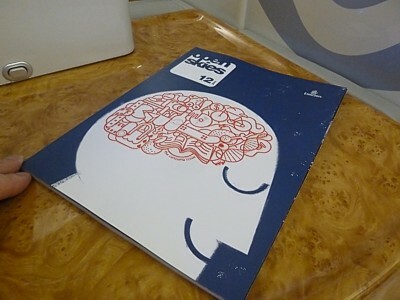 Emirates' thick, glossy, inflight magazine "Open Skies" comes in at a whopping 300 pages. It also has a unique double sided style - one cover, and one side of the magazine, is in English. 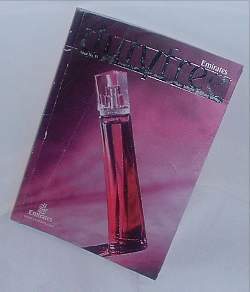 The other cover has a mirror image picture, and the same contents, but in Arabic, starting at the back. On flights to English speaking countries the magazines are put in seatback pockets one way around, to Arabic countries or back to Dubai, they are reversed. At least, that is the theory, but some of the crew can sometimes be lazy. Its a pretty good read, and better than most. The contents are good - although getting through the adverts just to the contents page is a struggle, and that is the theme of most of the magazine. A normal SpaFax Inflight Media production, most of the articles are bought in, and indeed you can sometimes see the same contents appearing in several inflight magazines with different airlines. There are about 20 articles, with usually five travel articles about Emirates destinations. Typically there is one per continent. Interspersing these articles there is a feature with an interview with someone you may just have heard of, another interview with a musician, two sports articles, two environment articles (of the "Save the Iberian Lynx" variety) something on real estate, and an article on shopping in Dubai. At the back, just before the page with the map, is a page of news on what Emirates is up to, and a page with useful information on Dubai. 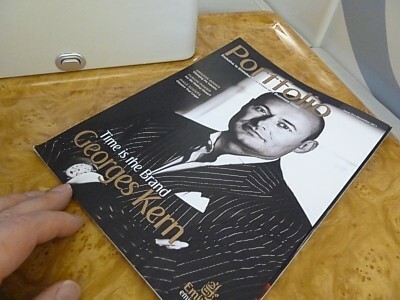 There is yet another inflight magazine, just for Business Class customers. Called Portfolio, it is a turgid read, full of articles on Management Education, how to achieve success, and where to do your MBA. There is always a long and lengthy branding section on why branding is so important, and why we should do more of it. It really will make you weep, but it does double as a miracle cure for insomnia. Emirates' may be an Arabic airline, but you can order Duty Free on board. Indeed, the duty free magazine is thicker than the Open Skies magazine. The bad news is that Duty Free refers simply to perfumes, jewellery, watches, and a whole host of other junk you never knew you wanted. If you want to buy booze, you'll have to buy it on the ground - Emirates aren't going to sell it to you on board. Prices are listed in US$ and UAE Dirham. Emirates will not accept GBP or AU$. It pays to check the rate of exchange of each before you get on board if you are planning to spend money - depending on the rate of the dollar, you can save 30% or 40% by selecting a good currency. Emirates have a thick TV guide to complement the complex arrangement of TV channels on board: indeed, there are no less than three versions of this, to go with the three versions of IFE. 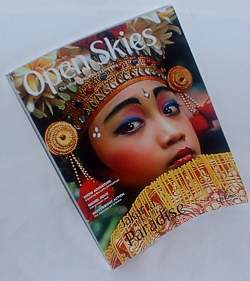 All are like the Open Skies magazine, in that it is reversible with one cover and the back half in Arabic. On the first page are some simple instructions explaining how to use the touch screens. The main one you'll get is called ICE Digital Widescreen: not surprisingly it lists with a synopsys the main films, although this is also available on the touch screen. 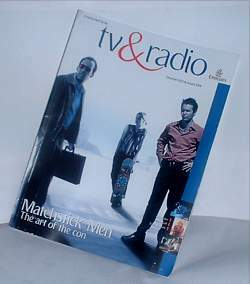 There is also the TV & Radio magazine for the older IFE systems. Emirates divide their film showings into Sets. On a short sector only one set will be shown. On long sectors up to four sets (eg: Dubai-Perth) are the order of the day. Exactly which Set you will get is shown in a table on the first few pages, along with a TV symbol if you will get the TV channels. On the next page is the set's channel listings, which which film is on which channel. Letters in the bottom right of the channel indicate the languages available, marrying up to a table on the top right of the page. The following pages then have a description of each film with the main blockbuster getting two pages, sub-films getting one, and recurrents a third of a page. In the middle (orange coloured) pages are listings of the inflight games, then pages of the radio channel listings.